My students, clearly, have been as busy as me. I've had very few lessons to review the past few weeks. THANK YOU! 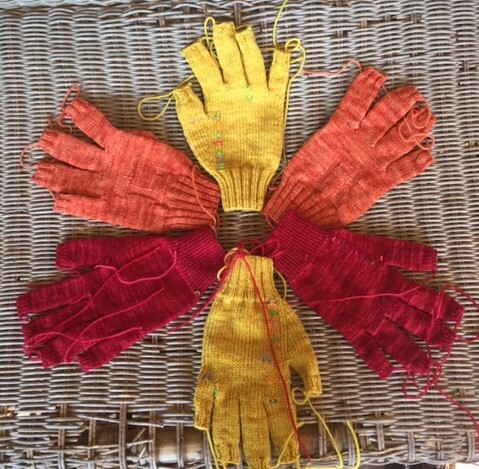 All I have been doing for the past week is knitting texting gloves for the Fashion Framework article in the Fall issue. I decided to to 3 pairs in different weights of yarn or 30 fingers. By the time I got to the 20th finger I more or less got it down. 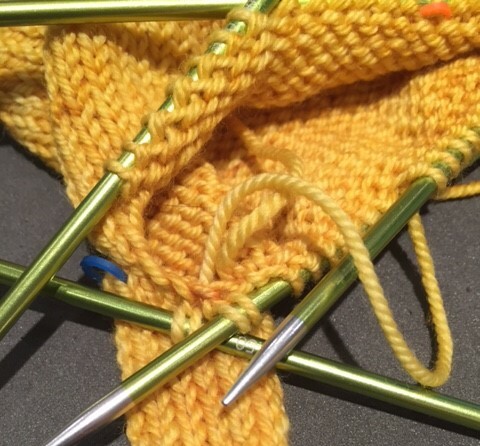 The reason most knitters prefer to make mittens or fingerless mitts is due to the tediousness of knitting and finishing fingers. Not only are fingers a pain to knit, the results can be mixed. It is difficult to work them so that there are not holes at the joins. What I found really worked were two things. 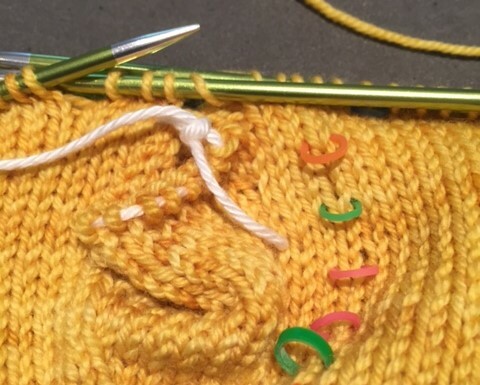 First, most patterns will tell you to use the "e" cast on to bridge the gap when knitting the individual fingers. The problem with this is that this cast on results in an excess of yarn no matter how tightly you work it. This creates large stitches and ladders at the join. Second, when you pick up stitches at these cast on edges, there is always holes at either side of the finger. Yes, you can fix this when you weave in yarn tails but it makes the finger joins even more bulky. To fix the first issue, instead of casting on any stitches I started working tight yarnovers at the join shown in the photograph below. On the next round you use the strand created by this yarnover to work two M1 increases, taking care to twist the strand. Does it matter whether they slant to the right of left? Not at all. This is shown in the photograph below. Notice that there isn't much excess yarn. Now for the second problem. If you look at the photo above it shows the location for the thumb. To work the thumb the stitches on the holder are transferred to needles and it is necessary to pick up two stitches in those cast on. The is always a gap where the finger joins the hand. 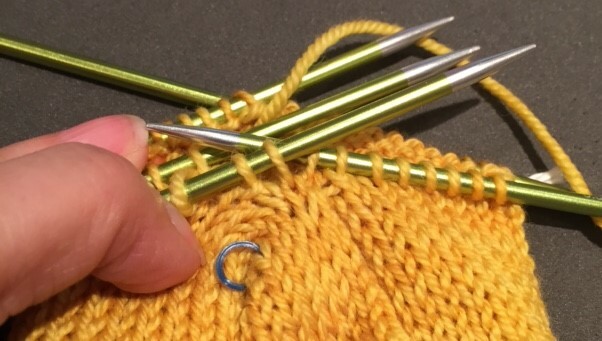 The solution I found was to do something I have devoted many blog entries to NOT doing when picking up stitches in a bind off or cast on edge. That is to pick up more stitches than you need. The rule for picking up stitches on a horizontal edge is to pick up ONE stitch for every stitch. When picking up stitches for fingers I recommend picking up four stitches in those two stitches. Pick them up in the stitch below and between the stitches but NOT in the holes. (Picking up a stitch in a hole just makes it bigger.) The photo below shows these 4 stitches. On the next round you close these holes by working decreases but not with each other but with the stitches BEFORE and AFTER the stitches you picked up. On the right side of the finger, work an SSK with the stitch before the new stitches, then knit the center two stitches. Then work a K2tog with the final new stitch and the stitch after the new stitches. If you look closely at the photo below you can see the decrease but what you don't see are holes. There are two videos for this: Part 1 and Part 2. Here are the gloves. Notice I haven't woven in any of the ends. Sigh. 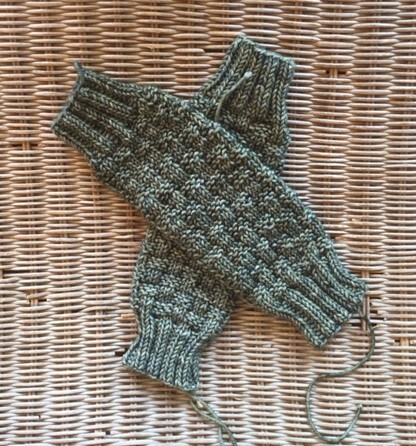 When I proposed the gloves I also decided to do a pair of arm warmers in a worsted weight. The Stitch Anatomy lesson is on the basketweave stitch. In the TNNA fashion show there were lots of ponchos. Arm warmers would be fun with a poncho. All of the yarn is from Anzula. 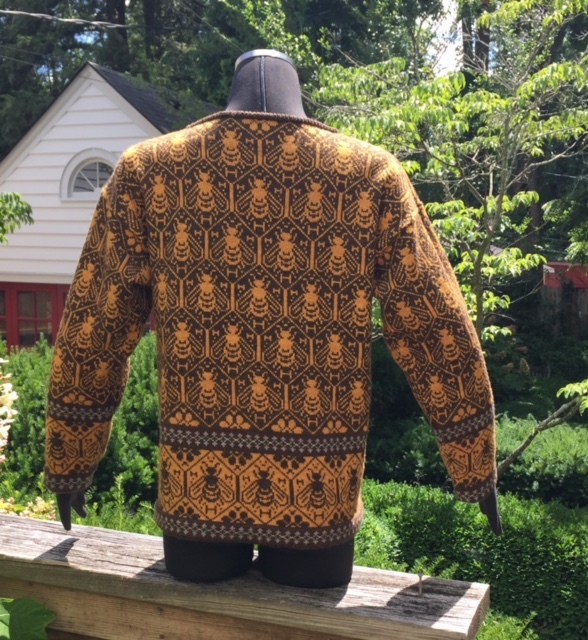 That sweater is gorgeous. H for Holladay? It would make a gorgeous inspirational background photo for my computer. Gorgeous, gorgeous, gorgeous. I've been on hiatus with my Basics(x3) class to do a mystery KAL but I finished it so this weekend I knit all the swatches (except extra credit) for Lesson 3. I'm hoping to block them tonight and do the gauge worksheets and extra credit tomorrow. I think my lesson should be to you early next week if not late this week, if all goes as planned. :-) Then on to Taming Tension! Your stranded colorwork is wonderful! I wish I could achieve such great tension but I've only done a few stranded projects. Practice makes perfect I suppose! Also, the gloves look wonderful. I have plans to knit a few pairs sometime in the future so I'm happy to have this reference for future use. Wondering if you could help me with some instructions that I don't understand. M2: knit into the front and back of the stitch below the next stitch on the LH needle. (2sts. Inc). 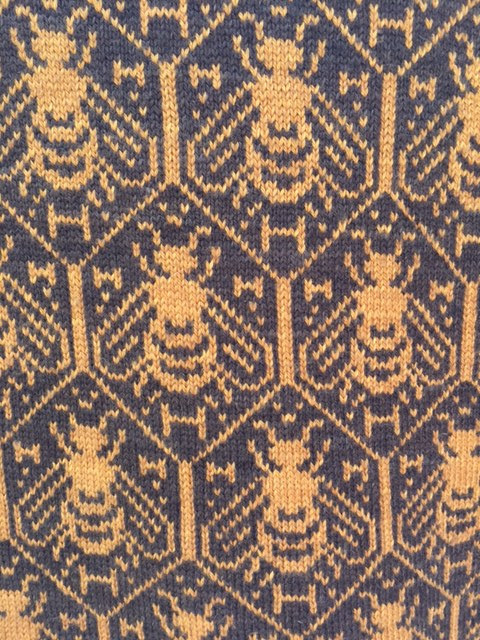 M2L: Knit into the front and back of the stitch below the last stitch on the RH needle. (2 sts. Inc). By "below the next stitch, do they mean the bar between the stitches as in a regular M1 or the actual stitch below? Any help would be greatly appreciated. Thank you. Arenda used the TKGA definition for M1, M1L, and M1R. They call the stitches you described, knitting into the stitch below, Lifted Increases. The M1 family is like the row after a yo increase, worked on the bar between two regular stitches. This article has good drawings, but doesn't include M1, sometimes called M1-open. To make the M1 increase without twisting, don't twist the yarn at all. It will look like a yo with a smaller hole. but it looks like part of the M1L description was copied to the end of the lifted increase section. The tincanknits page agrees with the definition in other TKGA publications. 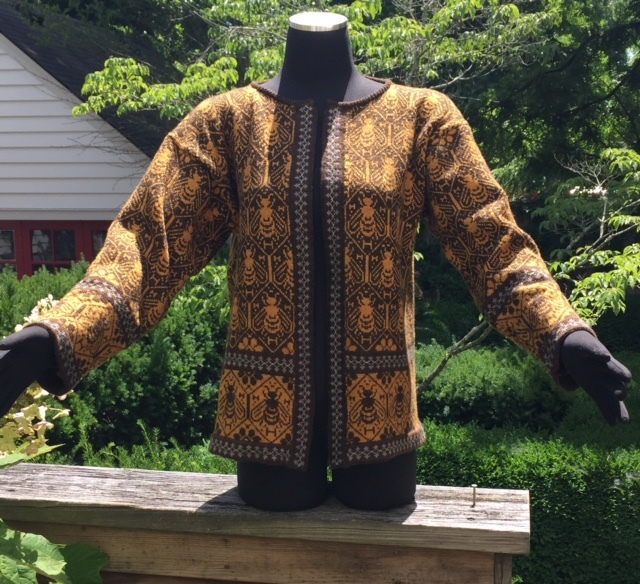 This site has the most common increases, but use dark yarn for the pictures. Different publishers will use different names, but the stitches are the same. Thank you so much for your help. There was no stitch glossary in the book so I was a little lost there. past simply keeping your hands warm. Select your Motorcycle gloves with care, and they'll deal with you in case of a mischance.